Knowing that an air fryer eliminates the need for cooking oil doesn’t help shoppers find the best air fryer on the market today. There are many things to consider while shopping for your first air deep fryer. Those considerations include capacity, controls, temperature range, reliability, and price. You could spend hours reading multiple air fryer reviews one at a time and end up more confused than when you began your research. To help our readers cut through the confusion and find the air fryer that will work best for them, we have listed the benefits of an air fryer, compared five of the top units on the market: giving the pros and cons of each, then offered a final thought as to which one is the best air deep fryer available. Can cook multiple dishes at once: depending on the fryer’s capacity and equipment, you can cook several dishes at the same time, allowing you to serve your entire meal while it is hot and as fresh as possible. ​Will reduce cooking time: air fryers circulate hot air around the food, allowing for a faster cooking time without compromising taste and food quality. ​​Cut back on fatty oils: there is no way to overstress the reduction, if not full elimination, of fatty oils. The only oil you will find in your meal will be those released by the meats that you prepare. A very heart healthy alternative to traditional deep fryers! ​​Minimal oil to dispose of: traditional deep fryers use approximately one gallon(more than 5 liters) of cooking oil, leaving owners with the conundrum of disposing of all of that oil. It can not be simply thrown on the ground or poured into the sewage system. That much oil can clog a septic tank, leading to expensive repairs. Air fryers do away with that annoyance, leaving you with only the oils that reduce from meats as they cook. ​​More convenient than hot oil fryers: while all fryers can be hot to the touch and a bit bulky in weight, air fryers are slimmer than oil deep fryers, allowing them to be placed in a more convenient part of your kitchen; out of the way of children and reducing the chance of an accidental spill. Additionally, air fryers are typically equipped with an easy-to-use timer that will allow you to walk away from the unit, freeing you to tackle other tasks while your meal cooks. ​Cleaner: the absence of cooking oil reduces the mess that you will have to clean up after cooking. On top of the reduced mess, you will not have to worry about spilling oil on your clothes. We have all thrown away clothing because an oily stain can not be removed no matter how hard you try. The air fryers that we will be reviewing today offer all of the benefits listed above. Our list includes the Philips HD9230/26 Digital Air Fryer with Rapid Air Technology; Philips HD9220/26 Air Fryer with Rapid Air Technology; T-fal FZ7002 ActiFry Low-Fat Healthy Dishwasher Safe Multi-Cooker, 2.2-Pound; Kalorik Convection Air Fryer FT37999SS; and the Avalon Bay AB-Airfryer 100B Airfryer. For a more complete apples-to-apples comparison, all of the units reviewed are black in color. The comparison, and final recommendation, will be based on five considerations: capacity, ease of use, weight and dimensions, controls and settings, as well as price. So, without further ado, let's have a look at how these products stack up based on the listed considerations. 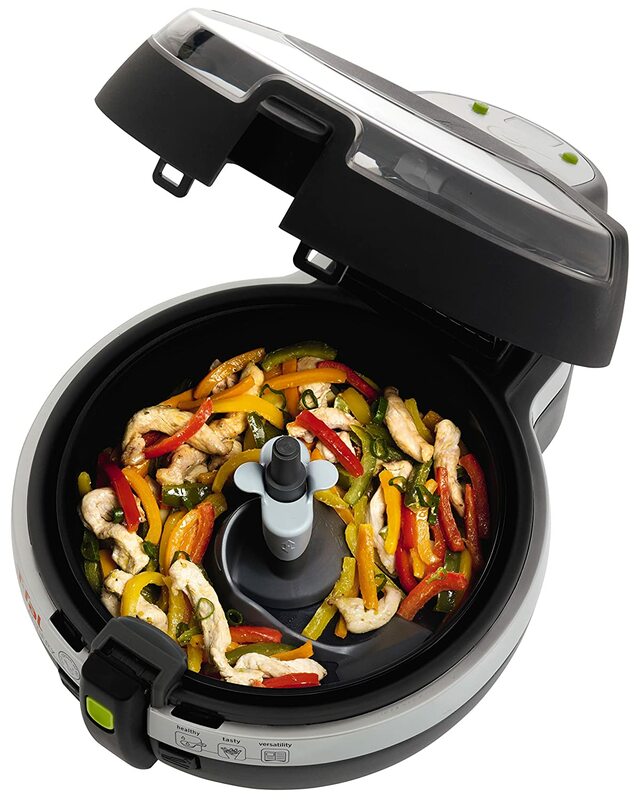 The T-fal FZ7002 ActiFry Lowoffers offers a great versatility for large families. One of the main limitations of any fryer is its capacity. A single person doesn’t need to cook as much food as a small family, who will not need as much as a larger family. Irregardless of the size of your household, you need to find a single fryer capable of cooking enough food for all. The Philips HD9230/26 Digital Air Fryer with Rapid Air Technology has a cooking basket that is capable of holding up to 1.8 lbs(just under 1 kg), more than enough for an average-sized meal. The Philips HD9220/26 Air Fryer with Rapid Air Technology utilizes the same 1.8 lbs(sub-1 kg) cooking basket as the Philips HD9230/26 listed above. The T-fal FZ7002 ActiFry Low-Fat Healthy Dishwasher Safe Multi-Cooker, 2.2 Pound uses a 2.2 lbs(1 kg) cooking basket as the name implies. With that capacity, it is the largest air fryer being reviewed here. A capacity of that size offers a great versatility for larger families. The Kalorik Convection Air Fryer FT37999SS lists its capacity in quarts instead of pounds. This fryer is capable of holding 4.2 quarts or 4.5 liters. The capacity of the Avalon Bay AB-Airfryer 100B is rarely listed in hot air fryer reviews. To find the information, we made contact with the manufacturer, who also lists the fryer’s capacity in liters. At 3.2 liters, this fryer has the smallest capacity of those being reviewed today. Despite being smaller than the other fryers, 3.2 liters is large enough for many of the meals you will want to cook. The Philips HD9230/26 is the easiest to use. No air deep fryer review would be complete without covering how easy each fryer is to use. After all, you, the end consumer, must be comfortable using their new fryer. In this category, we considered cabinet and counter top space taken up, materials, clear instructions, and ease of cleanup. The Philips HD9230/26 Digital Air Fryer with Rapid Air Technology is fairly slim when compared to other air fryers. It will take up less space than the T-Fal and Kalorik units reviewed here. It is equipped with a double layer rack to maximize cooking space; an uncommon feature with air fryers. Clean up is a breeze with a large number of dishwasher-safe parts. 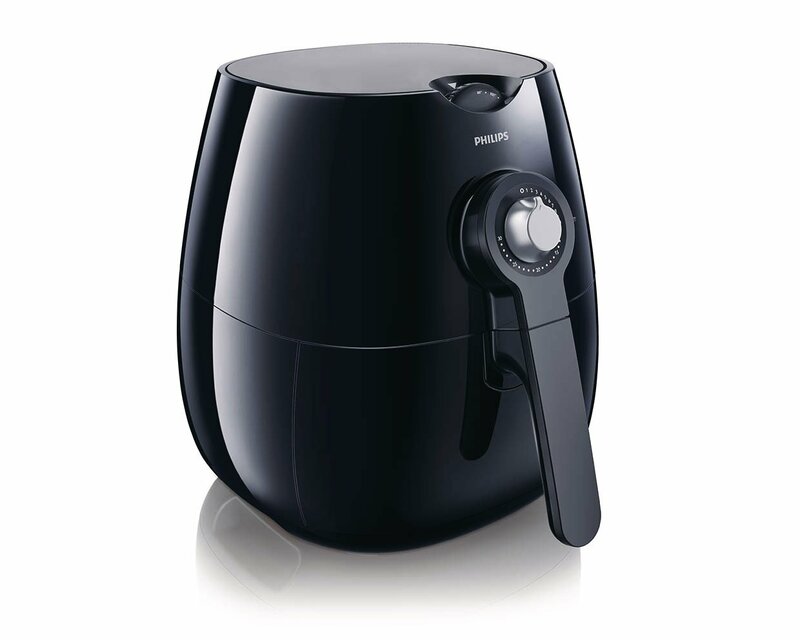 The Philips HD9230/26 is sold with a clear and concise instruction book for first time air fryer owners. Of the fryers listed here, the Philips HD9230/26 is the easiest to use. The Philips HD9220/26 Air Fryer with Rapid Air Technology shares a capacity with its cousin the HD9230/26, but it does not share all of the same features. The first difference is the lack of a double layer rack, minimizing the number of foods you can cook at the same time. Other than that, the HD9220/26 offers the same number of dishwasher-safe parts to shorten your clean-up time and effort. This unit is packaged with a clear instruction guide, as well. The T-fal FZ7002 ActiFry Low-Fat Healthy Dishwasher Safe Multi-Cooker is a fairly bulky unit. That is not to say it s a space hog, just larger than either of the Philips airfryer’s reviewed above. It is not packaged with a layering rack to separate foods, some what minimizing the cooking surface. The majority of the parts in the T-Fal FZ7002 are plastic and dishwasher-safe for near effortless clean-up. Where T-Fal goes the extra mile is by providing a clear instruction book, a 38-page cook book, and a measuring cup. The Kalorik Convection Air Fryer FT37999SS, while offering a smaller capacity, is somewhat bulky. It will take up more space than either of the Philips air fryers reviewed, but a tad less than the T-Fal. The Kalorik offers some dishwasher-safe parts, but not as many as the first three units listed, so clean-up; while still easy, is more time consuming. The instruction book is less clear than it should be, but it is accompanied by a small cook book. The Avalon Bay AB-Airfryer 100B is the smallest unit reviewed here: by both capacity and overall bulk. It does make up for that with a multi-use layering rack and a stainless-steel transfer rack to move your food from fryer to table in a single easy step. The unit is designed with a large number of dishwasher-safe parts for easy clean-up. The instruction booklet is very clear and concise as is the 52-page cook book. 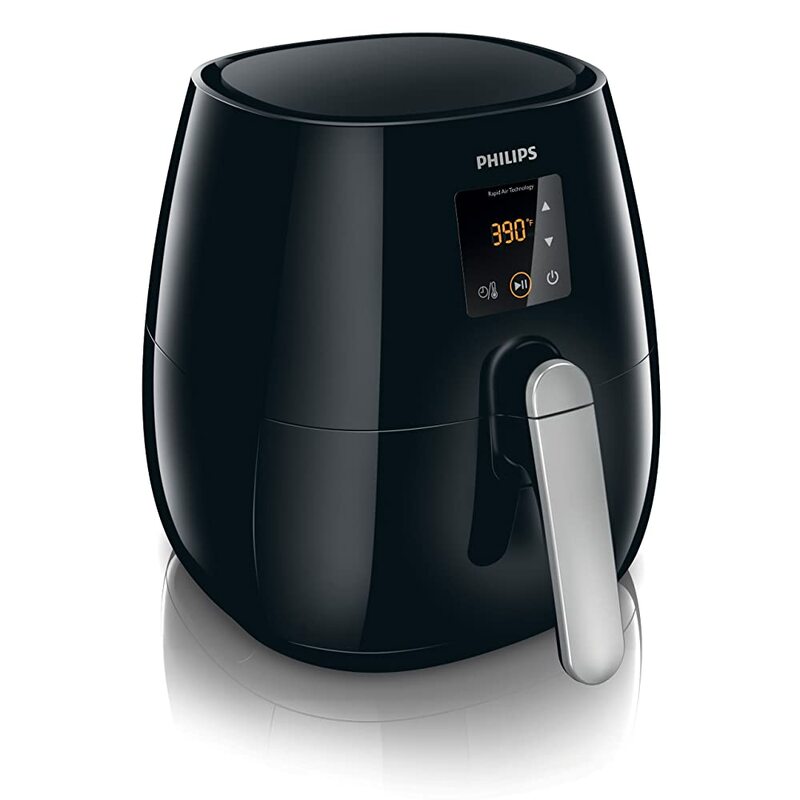 The Philips HD9220/26 Air Fryer has the exact same measurements as the HD 9320/26. No matter how easy to use an air fryer is or how large it’s capacity, if it is too heavy to move around the kitchen or is too massive for limited counter top space, it is the wrong fryer. These two simple measurements can be the difference between a small appliance that you can not live without and an overpriced dust collector. The Philips HD9230/26 Digital Air Fryer with Rapid Air Technology measures 15.3 x 15.3 x 14.9 inches, about the size of a small microwave oven. It weighs in just under 19 lbs(8.6 kg) when empty. The Philips HD9220/26 Air Fryer with Rapid Air Technology has the exact same measurements as the HD 9320/26. At 15.3 x 15.3 x 14.9 inches and 19 lbs(8.6 kg) this is very manageable unit to own. The T-fal FZ7002 ActiFry Low-Fat Healthy Dishwasher Safe Multi-Cooker measures 16.7 x 13.6 x 9.4 inches, making it a tad more squat that the Philips units, but bigger around. It would still occupy the same amount of counter top space as a small microwave. Where the T-fal stands out is its weight. Weighing in at just 8.9 lbs(4 kg), it is one of the lightest units on the market. The Kalorik Convection Air Fryer FT37999SS measures 15 x 12 x 12 inches, nearly the same size as the three units covered above. At just over 15 lbs(6.8 kg), it weighs slightly less than either Philips unit. The counter space needed would be the same as the other three air fryers listed so far. The Avalon Bay AB-Airfryer 100B measures a quaint 13.5 x 11 x 12.8 inches and weighs a slight 13.6 lbs(6.16 kg). Both measurements put nicely in the middle of the pack, but there is no escaping the fact that you must allow for the same amount of space occupied by your microwave or toaster ovens. The Kalorik Convection Air Fryer FT37999SS uses all manual controls for the power, timer, and temperature. Now that we have covered the space needed, ease of use, and cooking capacity, you may be wondering about the controls of each unit. Items like maximum temperature, timer, and manual or digital controls all matter a great deal to overall customer satisfaction. Each of these points are be covered in this section. The Philips HD9230/26 Digital Air Fryer with Rapid Air Technology features a digital touch screen that controls all functions. This air fryer has a sixty minute timer and temperature settings that range up to 390 degrees so that you can cook a wide variety of foods. The Philips HD9220/26 Air Fryer with Rapid Air Technology features simple to use manual controls for power, timer, and temperature setting. The HD9220/26 offers a 30 minute timer that automatically shuts the unit off and a temperature control that ranges up to 390 degrees. The T-fal FZ7002 ActiFry Low-Fat Healthy Dishwasher Safe Multi-Cooker features a digital read out for power and the timer. This unit cook at an even 338 degrees at all times, so does not allow for temperature control. The constant temperature does allow for even cooking of foods. The Kalorik Convection Air Fryer FT37999SS uses all manual controls for the power, timer, and temperature. It offers owners a 60 minute timer with a convenient automatic shutoff feature. This air fryer can be set to cook as high as 400 degrees. Only two units being reviewed here have a temperature range that high. 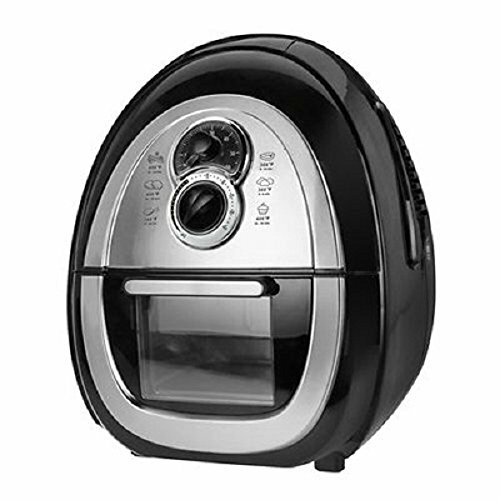 The Avalon Bay AB-Airfryer100B utilizes manual controls for all settings. It features a 30 minute timer with automatic shutoff and has temperature settings that range up to 400 degrees. Avalon Bay AB-Airfryer 100B may present the best value choice. The Philips HD9230/26 Digital Air Fryer with Rapid Air Technology, currently has the highest price tag of the units being reviewed, but is offered with free shipping. That price tag is offset by the wide variety of features the unit offers. The Philips HD9220/26 Air Fryer with Rapid Air Technology is currently priced at a 30 percent discount when compared to its larger cousin, the HD9230/26. That makes it the Philips airfryer with the best price on our list. The T-fal FZ7002 ActiFry Low-Fat Healthy Dishwasher Safe Multi-Cooker is currently selling for about the same amount as the Philips HD 9220/26 and has free shipping, as well. The Kalorik Convection Air Fryer FT37999SS currently lists for forty dollars less than the T-fal FZ7002. This unit also qualifies for free shipping. The Avalon Bay AB-Airfryer 100B is the lowest priced air deep fryer on our list, selling for less than one-half the price of the Philips HD9230/26. Additionally, the Avalon Bay AB-Airfryer is offered with free shipping. This unit is the best value for those working within a tight budget, but want a healthy cooking option. Every product has its pros and cons. For comparison’s sake, it is best to list those side-by-side so that shoppers can make the most informed decision possible. 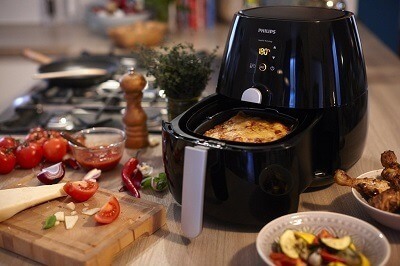 The Philips HD9230/26 Digital Air Fryer with Rapid Air Technology has many positive features. The main highlights are its all digital control system, 60 minute timer with automatic shutoff, and double layer cooking rack. On the downside, the HD 9230/26 is limited to 390 degrees and has the highest price tag of the lot being reviewed here. The Philips HD9220/26 Air Fryer with Rapid Air Technology, like its cousin the HD 9230/26 is a solid air fryer with many great features. The highlights of the unit include a 30 minute timer with auto shutoff, a multitude of dishwasher-safe parts, and a cooking capacity of 1.8 lbs. On the downside, it is also limited to a top cooking temperature of 390 degrees and does not offer a cooking rack. The T-fal FZ7002 ActiFry Low-Fat Healthy Dishwasher Safe Multi-Cooker is a versatile hot air deep fryer that can fit many budgets and takes up minimal counter space. The main drawback of this unit is its lack of temperature control. The constant 338 degree cooking temperature is effective, but causes meals to take longer to prepare. The FZ7002 is made almost entirely of plastic, a point that some may find a detraction. The Kalorik Convection Air Fryer FT37999SS has many features that a buyer will find convenient and attractive. 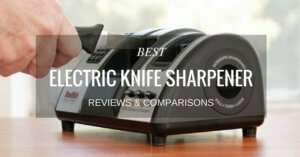 It offers a nice 4.2 quart cooking capacity, a 60 minute timer with auto shutoff, and a top temperature setting of 400 degrees. The biggest drawback to this fryer is the cooking capacity. For larger families, the 4.2 quart cooking basket may not hold enough food for a single meal. 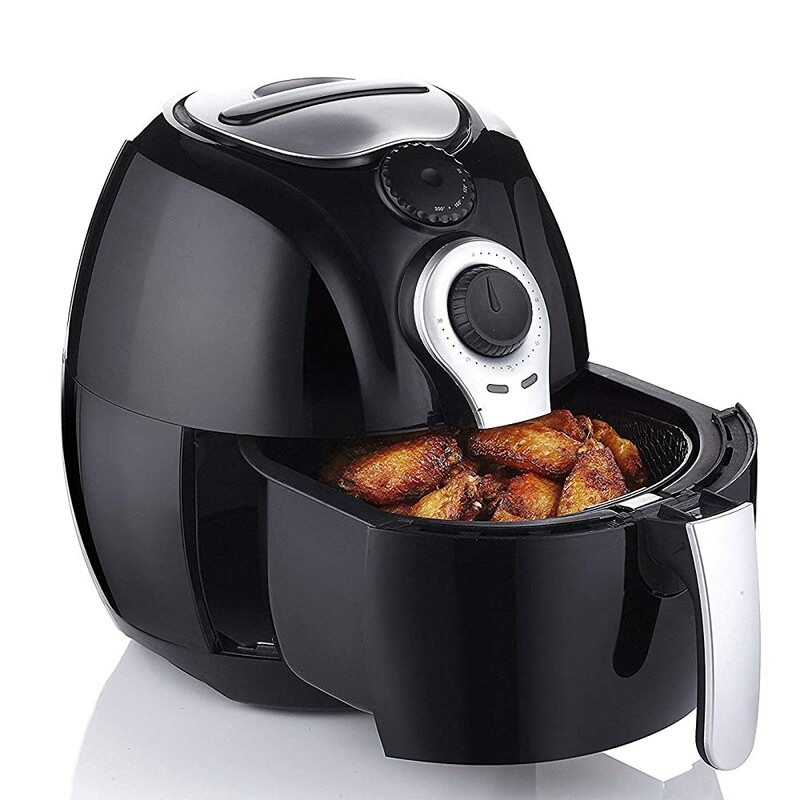 The Avalon Bay AB-Airfryer 100B has many pros to expound upon. In addition to a top temperature setting of 400 degrees, this unit is equipped with a 52-page cook book, has a 30 minute timer with auto shutoff, and offers the lowest price point of the air fryers we are reviewing. On the downside, the Avalon Bay AB-Airfryer 100B has the smallest cooking capacity at just 3.2 liters. This capacity is too small for large families, but is perfect for a single person or a family with up to four members. After reviewing these air deep fryers, we have a conundrum. 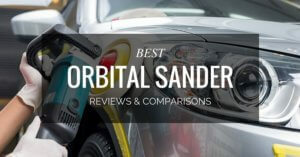 Two of the air fryers we have covered qualify as the best air fryer for different reasons. The best all around unit on our list is the Philips HD9230/26 Digital Air Fryer with Rapid Air Technology. 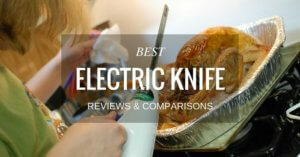 It’s large cooking capacity, numerous dishwasher-safe parts, high temperature setting, and digital control system put it head and shoulders above the other units on our list. When you consider the double layer cooking rack, it is hard to ignore the versatility and pound-for-pound value of the HD9230/26. Granted, the high price tag can be daunting, but the positive aspects of this product outweigh the additional cost. 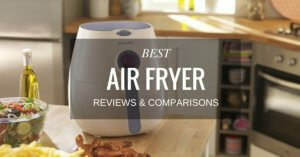 If you read Philips air fryer reviews, this is the Philips product that most consumers recommend. On the other hand, if you are shopping on a budget; simply do not want to spend a ton of money on your first air deep fryer; or do not need a large cooking capacity, the Avalon Bay AB-Airfryer 100B is the best buy for you. What you sacrifice in cooking capacity will be more than made up for in temperature range and cost savings, especially when compared to the Philips HD9230/26 Digital Air Fryer with Rapid Air Technology.